SC Johnson hasn’t been traditionally known as a green company. They still make plenty of cleaning products that aren’t very natural. I’d like to commend them on something though. They’re becoming more transparent. Did you know that you can go to What’s Inside SC Johnson to look up ingredients inside SC Johnson products? For example, SC Johnson makes a Shout Nature’s Source laundry stain remover. You can find those ingredients online now. Decide for yourself if the product is natural enough for you. You can even click on the ingredient names to learn more. Of course, you should do your own research and form your own opinions. SC Johnson will want you to like their ingredients. But wait a minute. Don’t companies list all their ingredients on packaging? Nope. In many cases they do not, but that’s where having a mobile phone comes in handy. Several times now I’ve called company phone numbers listed on packaging to ask questions about products while in a store. For example, what will happen if my cat eats this toilet cleaner? When a large company like SC Johnson makes their product ingredients available online they’re empowering consumers to make better choices. And if you have a smart phone, then chances are you can do your research while standing in the aisle. 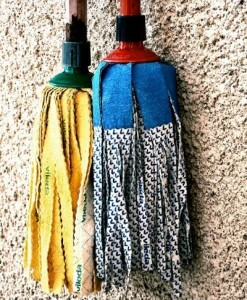 Another way to empower yourself is to make your own cleaners. That way, you’ll know without asking what’s inside. I have a fun Saturday tip for you: Reuse a glass spice jar to bring some summer indoors! I know I’m probably not the first person to think of this reuse, but it never hurts to recall simple ways to enjoy nature. Also, it’s good to remember that not everything has to be immediately thrown into the recycle bin. In this case, I accidentally broke off part of a petunia in the hanging basket outside my kitchen. I’m sure you can purposefully break off some stems too! Petunias grow like weeds, so says my husband. 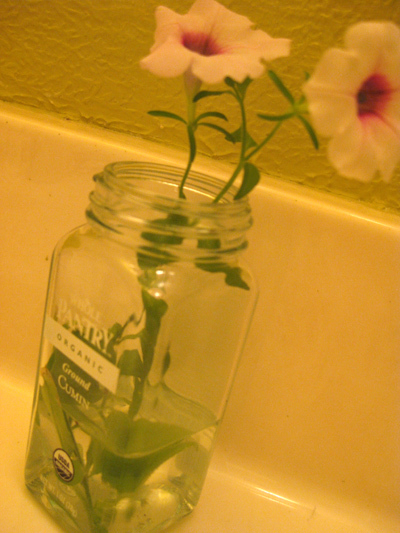 I dropped my freshly snipped petunias into an old cumin spice jar I’d been saving. It was instant (and free) sweetness in a corner of my guest bathroom. If you’re feeling extra creative, try decoupage to make your jar fit with your decor even more. I’m going with the lazy, whimsical “cumin” look for now. Of course, another way to reuse your spice jar is to fill it with spice from a bulk container at a store like Whole Foods. Pet owners: If you decide to do this with a petunia, don’t worry. ASPCA lists the petunia species as non-toxic to cats and dogs. That’s such a bonus to me with my two ever curious cats. 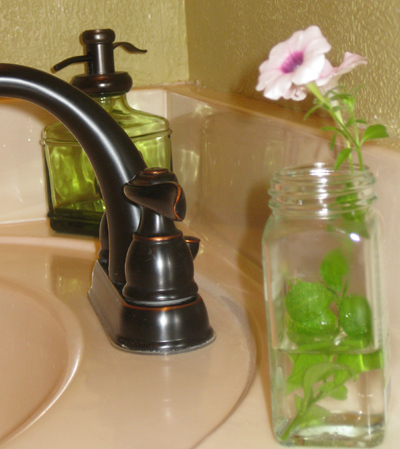 Place jars beside the kitchen sink and add a few lemon or orange peels to the bottom for more color. Use as part of place settings with a single flower in each jar. Tape name tags to jars or paint names on. Arrange several jars on a cupcake tree or cake stand for a fun centerpiece for a party or dinner with friends. Line up a few jars on your mantel or other shelf. Alternate colors: white rose/red rose, etc. How else do you reuse spice jars? 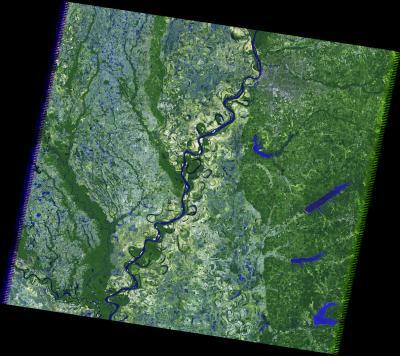 Newly released images captured by the USGS and NASA on May 10 reveal how much more mighty the Mississippi has become. 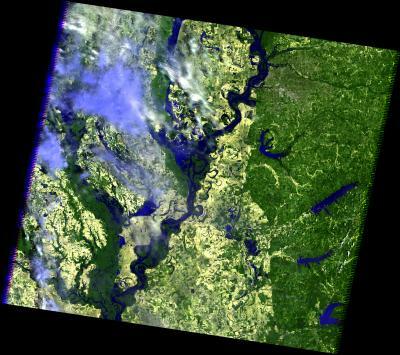 Taken from 438 miles above the Earth, the new image shows the major flooding of the Mississippi River around Memphis, TN and bordering states. Visit NASA’s Earth Observatory for more images. If you’d like to give to flood relief efforts, visit the Red Cross, United Way of the Mid-South or Salvation Army. If you hate bad art, then create your own. You don’t have to be artistic. 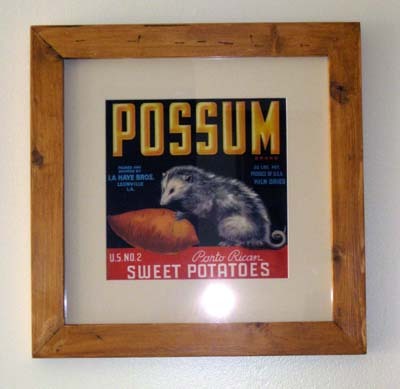 The old labels used on fruit and vegetable crates from the 1930s onward are a fun way to add some vintage character to your kitchen or other area. 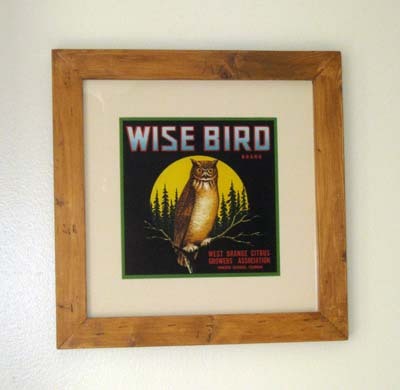 I found three old labels recently on eBay and used reclaimed wood to build frames for them. Well, I should come clean. It was my husband who built the frames. We used wood from some old valances that we removed from our breakfast area. To stain, we found a water-based product at the hardware store. The wood was already somewhat distressed from the staple holes used to attach fabric. You can see the staple holes better in the last shot. 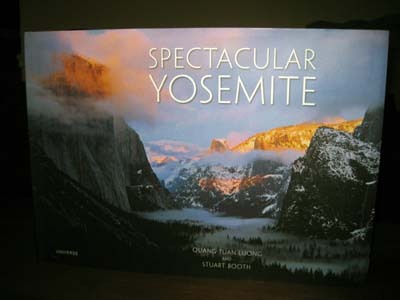 If the goal was to make you want to see Yosemite National Park for yourself, then photographer Quang-Tuan Luong and author Stuart Booth accomplished that with their book Spectacular Yosemite. I’ve never been to Yosemite National Park, but it’s now on my short list of places to visit. Spring seems like the ideal time to see Yosemite with all its many impressive waterfalls. Is Spectacular Yosemite for you? If you’re looking for a great coffee table book full of amazing photography of a natural wonder, yes. You’ll also learn more about the park, including its history. However, the big focus here is on the photography. Why a book about a park? Spectacular Yosemite is all about showing you Yosemite National Park. I believe that words probably can’t describe the park. And, if we’re honest, photography probably can’t do it complete justice either, no matter how skilled the photographer. Rockin’ Green laundry detergent is preferred by many mothers who use cloth diapers. The reason is quite simple. 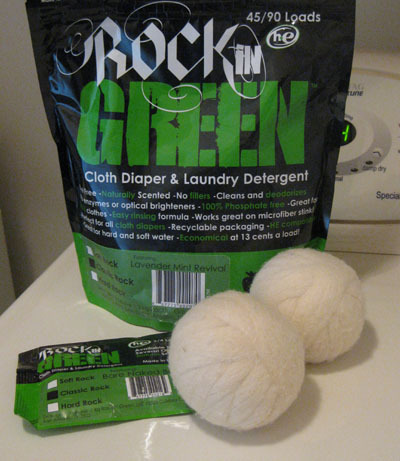 Rockin’ Green doesn’t leave behind residue that can interfere with the ability of cloth diapers to absorb. That said, I didn’t use this laundry soap on dirty cloth diapers. I don’t have a baby, so… However, I’ve read many positive reviews online from cloth diapering mothers who can’t say enough good things about Rockin’ Green. I also have a family member who uses Rockin’ Green for cloth diapers and loves loves loves it. In fact, that’s one reason I decided to give it a try on my laundry. There are several things to love about Rockin’ Green, even if you don’t need it for cloth diapers. It doesn’t leave behind any scent on clothes, but you can buy it scented (or not) if you want the smell goods during laundry time. It comes in three customized formulas so you can get the right stuff for your needs and water type: Soft Rock, Classic Rock and Hard Rock! And, of course, it’s biodegradable with 100% natural scents and earth-friendly ingredients. For more details, check the FAQ at Rockin’ Green. I finally hung the birdhouse I received as a Christmas gift. 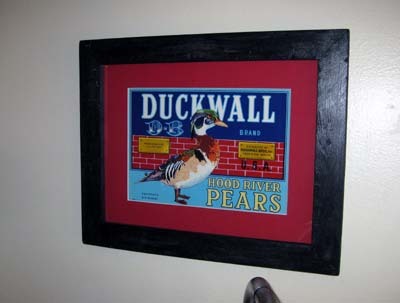 It was made from reclaimed materials by a vendor at a local farmer’s market. It’s my spring gift to the birds! 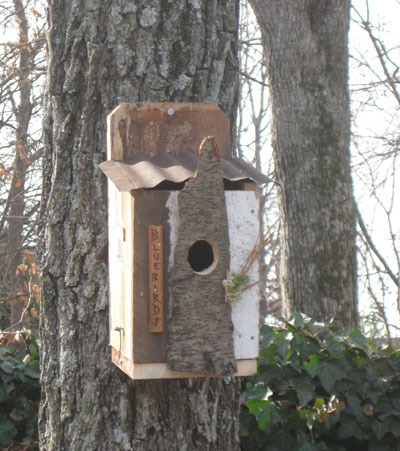 If you’re looking for a new birdhouse, then please spend some time hunting down a recycled or reclaimed birdie dwelling. You’re likely to have luck at Etsy. Just do a search for “recycled birdhouses,” and you’ll see lots of options, including houses made of pine needles and license plates. Also, don’t forget trying to go local by checking out craft fairs and farmer’s markets. For more inspiration, you really must check out the awesome Top 10 Recycled Birdhouses post over at greenopolis! One of the houses even uses an old shoe. CNN dared me to do this. But seriously I love reading cooking suggestions from ads in magazines from the 30s through the 60s. I’ve always been tempted to try a recipe, but am usually too grossed out. Tonight, I suppose going out to buy cream-style corn and frankfurters was entertaining. I can’t remember the last time I bought either, but I’m positive I’ve never bought them both at the same time, especially on a Friday night. Why do this on a green blog? 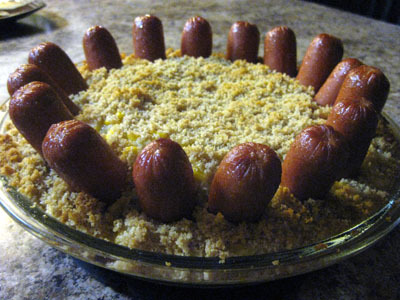 Perhaps to celebrate how Better Homes and Gardens no longer publishes a “meat cook book,” where the Frank and Corn Crown made its debut. At least I hope they don’t! For the full recipe and the vintage Frank and Corn Crown photo (to compare with my lovely creation), visit CNN: Vintage Cookbook Vault: Franks a lot! Produce minimal noise. The softness of these balls makes the low noise level possible. I found Nellie’s balls to be super loud compared to these. Soften fabric. You can skip fabric softener and still end up with soft clothes. That saves you money and helps prevent waste. Since using liquid fabric softeners may interfere with the absorbency of cloth diapers, these dryer balls are extra handy for mothers. Handmade in USA with 100 percent wool. Plain and simple! Wool stays off clothes. For the most part, the wool is staying on the ball, not clothes, though I’ve found a rare strand of wool on a towel. May be OK for allergies. I’m not a doctor, so I can’t guarantee these won’t bother you. Wool typically makes me itch and sneeze, but these balls haven’t bugged me. Some static remains. The wool dryer balls will help reduce static, but you’ll still experience static on some clothes. They go exploring. You might have to hunt down a ball or two when emptying the dryer. Often, they’re just hanging out in easy sight, but I sometimes find a shy ball inside a sleeve. They’ll pick up lint (pictured ). 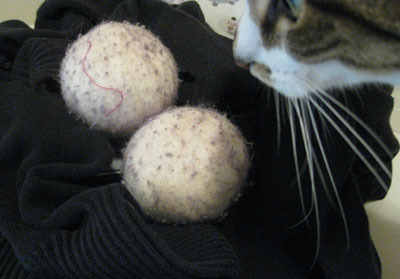 Not that it’s a problem, but when you dry a new fabric, you’ll find some lint from said fabric stuck on the dryer ball. However, you don’t have to pick it off. It falls off itself later on and makes its way into the lint trap. Pilling occurs. This is natural, but some materials like Velcro may cause worse pilling. But do they reduce drying time? Word around the Internet is that the more dryer balls you use, the lower your drying time. I used just two balls. I’ve noticed a small decrease in drying time, but nothing super dramatic. Cat lovers will note how my kitty Oscar (above) wants to use these balls for playing. Just be careful kitties don’t follow them into the dryer. Finally, what about scent? These balls come unscented, but it’s possible to scent your own dryer balls. How many wool dryer balls do you use? Does your spring cleaning involve getting new eco-friendly rugs? Replacing a worn rug with a natural fiber rug can be a good green choice. And you can enter to win a 4×6 Elements Driftwood sisal area rug from Merida, makers of area rugs via natural, sustainable fibers for more than 30 years. For your chance to win, you must enter before March 14, 2011. Please note: Commenting on this post doesn’t enter you to win. You must visit the Merida website to enter. Disclosure: Posting about this contest means I also have a chance to win one of these natural fiber rugs. Did you know? Light Green Stairs is on Facebook!